Cupcakes, cupcakes, cupcakes… Brides want them! 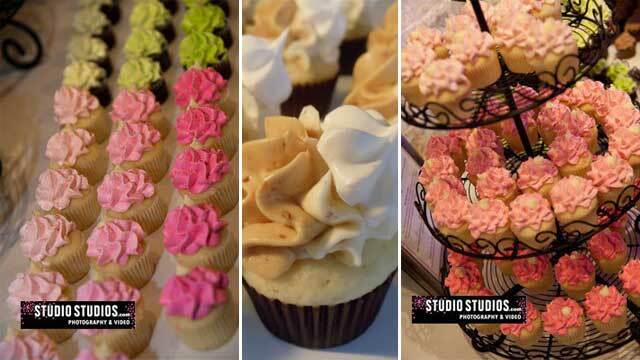 With the evolution of “the cupcake” in full motion and so many options available, Brides are finding more and more ways to incorporate cupcakes into their special day. Cupcake creations have transformed from the former idea of the over sugared and under-thought-out dessert into divinely delicious, gourmet treats. With so many flavors and styles available to choose from Brides can now add elegance and flare by using cupcakes in ways that were not always possible. Brides can now get creative incorporating all their favorite tastes along with their wedding themes and color schemes! In lieu of the conventional wedding cake, Brides are increasingly giving cupcakes this important leading role. Rather than having one cake, Brides are choosing to have hundreds of tiny little ones, providing gorgeous, bountiful displays of tasty little cakes for all to enjoy. Individually portioned and easily mobile not to mention [must we say] often fresher… larger cakes are often made days in advance… the options are really limitless. From the more traditional tiered stand to podiums and seas of cupcakes, the little cakes are not only delicious but are visually stunning! Cupcakes do not stop here; Brides are finding many unique ways to incorporate their favorite little cakes on their special day! Cupcakes are now often showcased at the dessert table, at the midnight buffet, as table center pieces, as wedding favors or even as bouquets. Cupcakes are finding their way into your special day and your imagination is really the limit! Always happily received by Brides, Grooms and guests alike, cupcakes are showing an ever increasing presence and loving every second of it. Your wedding is a day you’ll never forget; celebrate it with family and friends and now cupcakes! ← WHO IS GOING TO MARRY US?